A nice, easy dessert which is very filling so a great choice after a light meal, or maybe as a treat later in the evening. Dry fry the buckwheat until browned and fragrant. Take the pan off the heat and add the sweetener and cinnamon with 1-2 tbsp water. Stir until the water has evaporated and leave to cool. 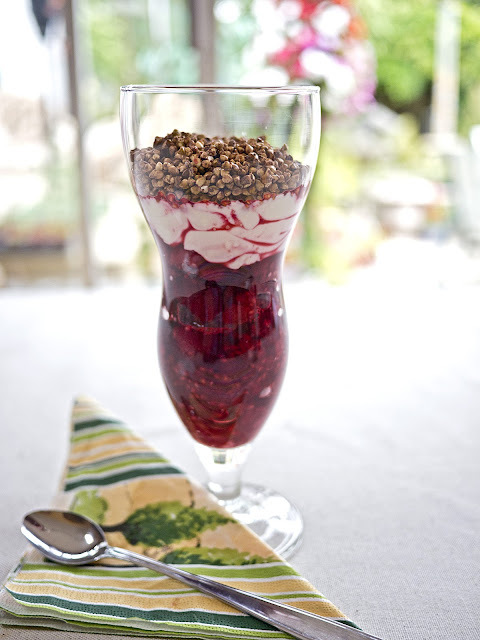 Place the raspberries in the bottom of a knickerbocker glory glass. Stir the cream cheese with a tablespoon or two of water to make it soft and a little runnier, then add sweetener to taste. Spoon on top of the raspberries and top with the crunchy buckwheat.